What is your connection to the Lothians? My husband and I moved to Edinburgh 22 years ago after a four-year stint working in Hong Kong. We feel so lucky to have ended up here, and it’s been an amazing place to settle down and raise our three children. Have you a childhood memory of Edinburgh? I grew up in Harrogate, and my family spent many summers at Yellowcraig Caravan Site – swingball, barbecues, piles of books, wasps (of course!) and hours and hours on that beautiful beach. We came through to Edinburgh several times to see the Edinburgh Military Tattoo, always with black binbags to sit in – I don’t think we were ever very lucky with the weather! Are you a ‘gloomy-fog-over-the-castle’ or a ‘summer-on-Princes-Street-gardens’ type? Oh, definitely a bit of both! I love the clear, sunny crisp days for being out and about in the city, but there’s nothing like a dark, dreich day for settling down with a good book and a pot of tea for a long day of reading. How would you introduce us to your passion? Well, my passion is reading – our home is full of books and my husband is threatening to bring in a ‘one in, one out’ policy. This has been tried before and always ends in abject failure – it feels like parting with friends! 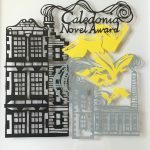 I run the Caledonia Novel Award, which is an international competition for unpublished and self-published novelists. We work with exciting literary agents to discover new talent and hopefully encourage new writers – it’s a brave thing to put your first novel out into the world! Is there a typical day? What does it involve? My typical days will change from next week, when my youngest child heads off to university. However, from now until next January, when the winner of the Caledonia Novel Award 2019 is announced, I know that a portion of my day will involve reading competition entries, which is always a thrill – I never know what each day will bring. What’s your greatest achievement so far – personally or professionally? My greatest achievement personally will always be our three children, who are a blessing and make us laugh every day. Professionally speaking, my proudest achievement was announcing the winner of last year’s Caledonia Novel Award. We chose The Doll Factory by Elizabeth Macneal, who comes from Edinburgh. She was signed up by the competition’s shortlist judge, Madeleine Milburn, and her novel will be published in 27 languages and is Picador’s lead debut fiction launch of 2019. So exciting! This year’s judge is Victoria Hobbs, who is a literary agent and director at A M Heath Literary Agency, and I know she’s really looking forward to discovering fresh talent! I love the beaches in East Lothian – my favourite is Seacliff – that tricky drive down the track through the woods and the reward of the first sight of the Bass Rock through the dunes – unbeatable.